One of the toughest things about setting goals you can keep is planning out further than a single week. Life is messy, and plans change. Sometimes it feels like the month can fly by and I have no idea where all that time went. 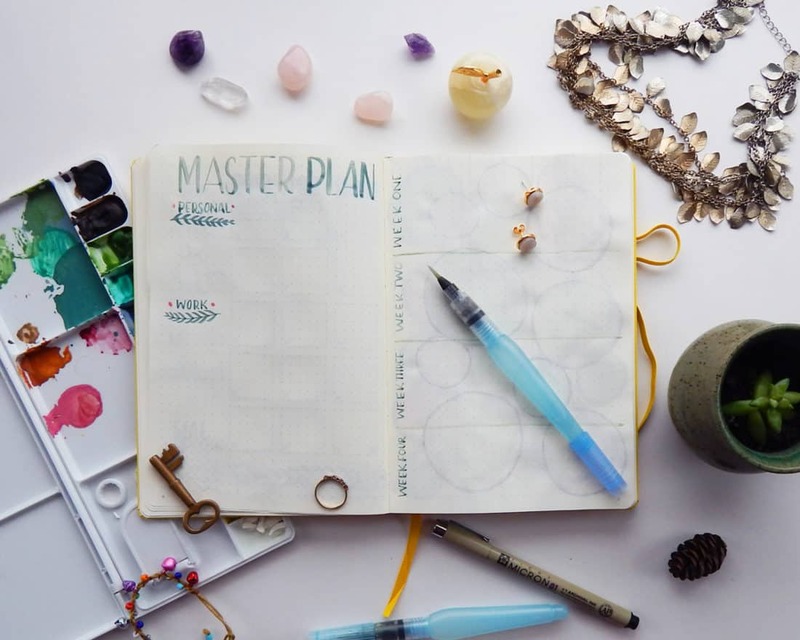 If you are familiar with the bullet journal, you probably know that the original system encourages setting monthly goals when you set up your monthly log. But I, like lots of other people, found myself migrating those goals over and over again. I would put off those items until the end of the month, which is not a great way to get things done! That’s when I decided to fix that by creating a Master Plan. On the page immediately after my monthly log, I dedicate a spread to my Master Plan. The left page is where I list out my goals, both personal and work goals, while the right page is where I break things down. I separate the page into four categories one for each week of the month month. Then I look at my goals and figure out how I can break them down into smaller, more manageable tasks. This dissection of a big goal into smaller tasks not only helps me feel less overwhelmed because everything is less abstract, but it helps me actually work toward the goal in a reasonable time frame. I have always struggled with big projects or goals because I don’t always know what to do next or when to do it. The reason creating a Master Plan is fantastic is because after it has been created, you don’t need to put much brain power behind the goal – you just do it! I don’t need to fuss over what to do next to plan for my trip, because I just need to check my Master Plan to see what is next on the to do list. 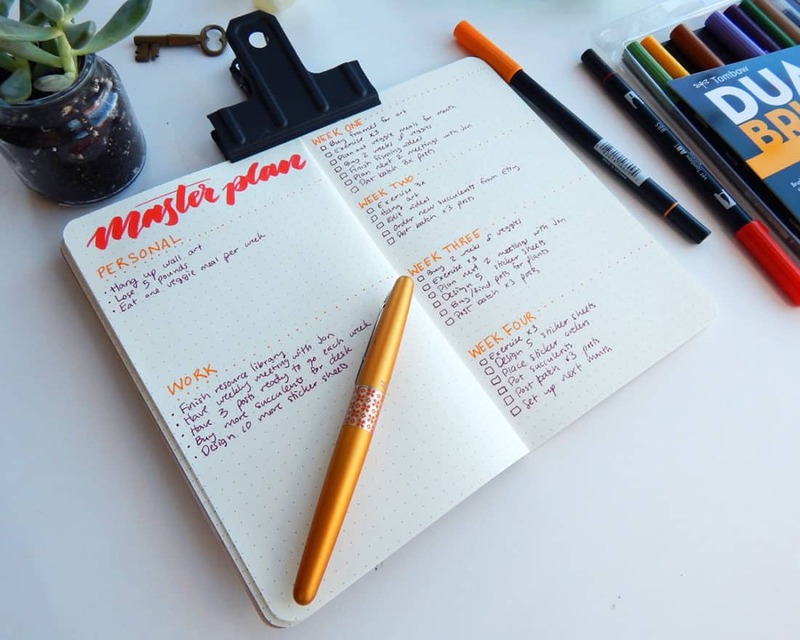 This little planning technique is perfect for school projects, work assignments, household chores like spring cleaning, or any other big task that needs more than a single day to complete. I wish I had thought up a Master Plan when I was still in school! I was the queen of last minute projects done in the dead of night. Allocating small pockets of time over a month is a million times less stressful than waiting until the eleventh hour – trust me. You can set up your Master Plan to be as simple or elaborate as you like! I try to keep mine pretty simple, but I do like to keep the colors and style within my monthly theme. I’ve used Tombow Dual Brush Pens, watercolors, and good old fashioned black ink brush pens to set this spread up. If you want to see the process of setting it up, check out the video below! 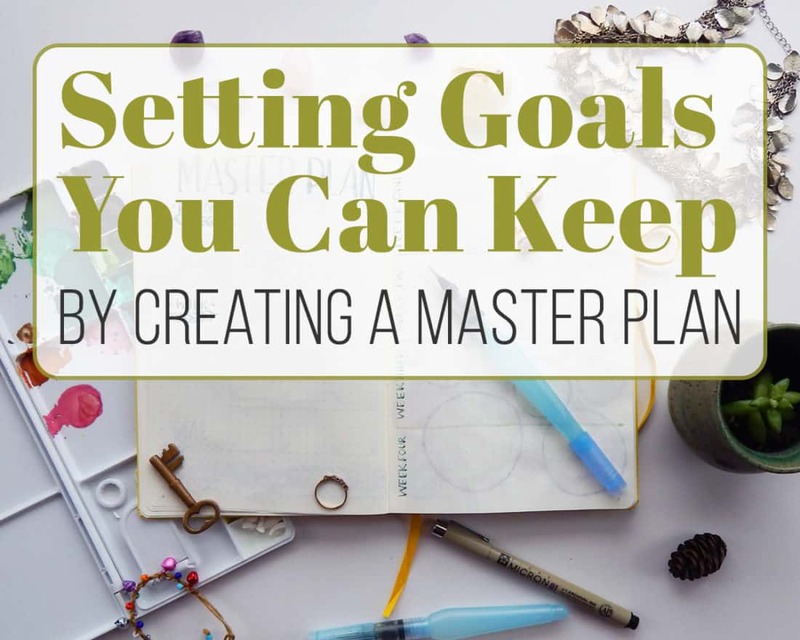 Besides dealing with tasks and responsibilities, creating a Master Plan can help with your personal goals. For years, I struggled to begin working towards my big goals because I never felt that I had time. Like I said earlier, time has a way of slipping past you, and before you can blink a few days can turn into a few months. This makes it so difficult to make any progress with health, art, budgets – you name it. That’s where the Master Plan comes in! Make a weekly goal of doing one or two small things, like going to the gym or sketching for 30 minutes. Write them as weekly goals in the Master Plan, and then they are tasks, not some far away goal. You can achieve them week by week instead of as some abstract goal. These small, actionable steps can go a long way towards making progress you can actually feel. This is especially powerful when paired with the habit tracker. A few steps each day or each week can take you places you never imagined! If you sign up for the Fox Den Resource Library right here or in the sidebar, you can grab my free Master Plan printable! You make some very good points. I break all of my goals into mini goals and I use chore sheet to mark off the mini goals as I complete them. When I use the chore sheet I don’t feel overwhelmed and I’m more organized. Thank you for this post. That is a great way to make progress and track it without feeling like there is just “too much” to do! This is just what I needed! Thanks. Awesome! I love it. August will have a master plan! ???? Thank you! 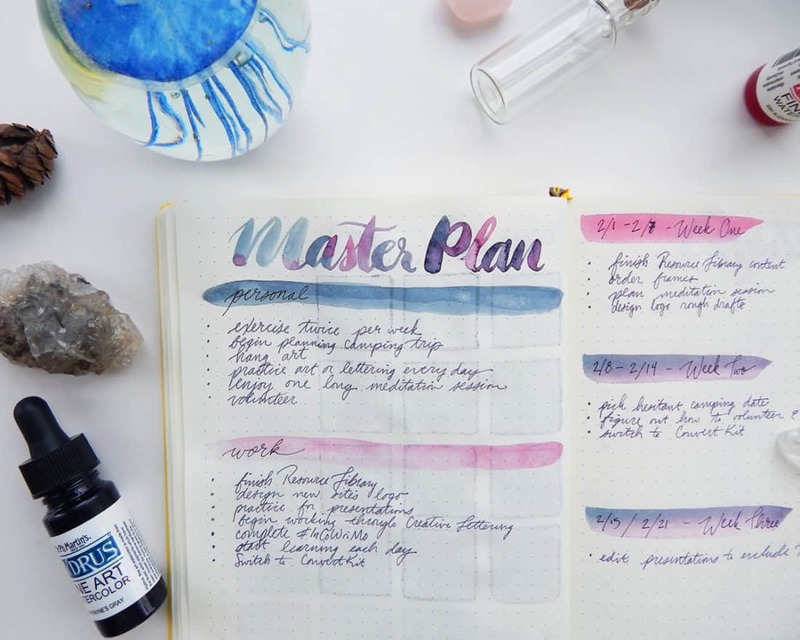 I totally need this… I’ve been having the same problem with monthly goals being migrated every month, and when I put them on the daily, they just didn’t get done because it was unrealistic to have such a big goal done in one day. Thanks for breaking down the organization and giving visual examples – always a huge help for me! I will definitely be using this in my next monthly set-up. I had the exact same problem, Joanna! It’s frustrating to continue to migrate a big task because you just can’t think of a time to get it all done at once. I’m hope this technique is the same relief to you as it was for me in terms of tackling those big goals! Very professional and I loved your organizational skills. Thank-you so much!! Have a wonderful Life Journey!!! I really enjoyed this and I plan on implementing a master sheet in my next month’s spread. I’m so happy to hear that, Solange! I hope you find it to be super useful! That’s awesome, Rachel! I hope you find that it’s as helpful for you as it is for me 😀 thanks so much for reading!